From a small in-wall installation to a 20-foot monster, we’ve got you covered. We’ve been building custom tanks for over 27 years in Arizona. 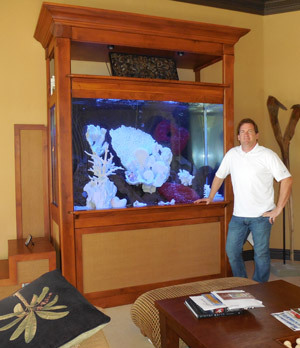 Give us a call, and we’ll be happy to meet with you and/or your architect to design a perfect aquarium for your space. We offer a variety of life support options to match many budget requirements. Obviously we prefer to use the best most efficient pumps and filters for the specific aquarium design to enhance the overall function of the aquarium, lessen the extreme maintenance needs and provide overall exceptional water quality for the aquarium inhabitants. There are a variety of life support options available including those of lower cost and efficiency as well as minimal plumbing requirements that can be met to keep your animals alive with probable higher maintenance costs and somewhat acceptable results, However, we like to see fish absolutely thrive in a crystal clear, chemically and biologically balanced environment. When considering adding an aquarium in a new construction project, Contact Us in the design and planning stage so all the aquarium requirements are met. This can make the difference between an aquarium that looks like it was added to the area or an area that was designed to have the aquarium as its focal point. This is also a time to address maintenance requirements such as access and moving water into and out of the aquarium. It is helpful to address all the plumbing, electrical, ventilation, and access requirements before construction begins. 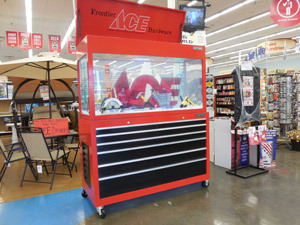 We use custom manufactured acrylic aquariums that are made from American manufactured acrylic. These are available in just about any size and shape you can imagine including odd angles and curves as well as cylinders, bull nose and bow front aquariums. The possibilities are endless. We also recommend heavier gauge acrylics to reduce distortion and stress related issues. All aquariums are drilled and plumbed so that the life support is neatly tucked away within the aquarium cabinetry.